House and time at Malvern: Sch, 1913 - 1916. Died: 24 September 1918 aged 19 in France. Died of wounds near Peronne. 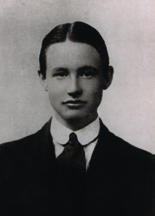 Son of Henry Lakin Lawrence and Emma Lawrence, 19 Walpole Terrace, Brighton, b. Feb 14th 1899. Upper V—Army I. House Prefect. R.M.C. Sandhurst; 7th Bn. Royal Sussex Regiment. 1917. 'Tom Lawrence was wounded on September 23rd, and died at a casualty clearing station the following day, never having recovered consciousness. At School he was a well-known figure amongst his contemporaries, always anxious to take his part in any activities, and an enthusiastic member of his House. Full of spirits, and ever ready for an argument, behind an easy optimism that a stranger might mistake for irresponsibility, there lay a genuine loyalty to his friends and School, and a depth of feeling he could not always conceal.' (Malvernian, Nov 1918). '24/9/18 Enemy attacked under heavy barrage at 11.30am, & was driven off with heavy casualties. 2/Lt T E Lawrence wounded early in the morning & died of wounds later in the day.' (Unit War Diary extract).